I'm a fourth generation Arizona farmer, who began my farming career the summer of my 8th birthday, hoeing weeds and helping with the irrigation of our family farm's (Agricultural Enterprises Inc.), cotton, alfalfa and grain fields throughout the southwest valley. I became a tractor operator at the age of 10, and a regional supervisor at 16. While still in highschool, at my dad's suggestion and with great encouragement and assistance, I leased 35 acres in Laveen for cotton production. The profit from the crops both paid for college, and instilled a strong entreprenurial spirit. Post college, I founded Agrizona III, a Laveen and South Mountain based farming operation engaged in producing the traditional Arizona crops I had grown up with, and I began growing broccoli, cantaloupes and watermelons with AEI. The early '90s brought urban encroachment and dwindling commodity prices, which prompted exploration into alternative, specialty crops. An informal poll of some of the valley's most influential chefs produced a resounding "YES", when asked if there was interest in fresher, locally grown exotic produce. In 1996, with tremendous input from the local chef community, I started growing exotic, specialty produce full time. My brother's Sunfresh Farms(now Duncan Family Farms), had already begun growing conventional vegetables, and they provided valuable experience. Today, we continue to work very closely with our chef clients, relying on their input to maintain the very highest quality in our over 150 varieties of seasonal sustainable specialties. I look forward to the challenges presented by the chef's annual planting "requests", which resulted in the first Tuscan Kale planted in this region, cardoon, and this year's Angelica. 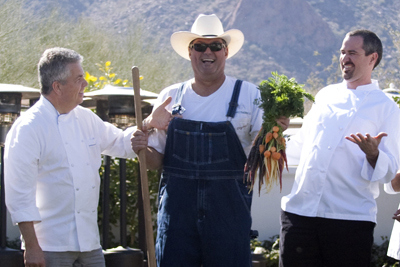 It's been a delicious ride, and I look forward to seeing you at my annual "Farmer in the House" dining series, Vincent's Camelback Market every Saturday morning, or at any of the better restaurants throughout our beautiful state.